When I set my eyes on Bali I knew I wanted my days to be relaxing and what better way to relax than visiting a spa? I did a lot of research online and reached out to a lot of places to inquire about prices and locations. In the end I narrowed it down to Fivelements. The atmosphere just seemed so tranquil, the prices were moderate and the flower baths looked to die for. Fivelements is an eco conscious wellness retreat which is mainly why I was drawn to it from the first glance. The healing and spa facility is inspired by the old and new Balinese way of life which is described as “nurturing harmony among spirit, human and nature”. The resort is located half an hour outside of Ubud. If you would like to read more about the hotel and spa, click here. This is what the view from my spa room looked like. The whole establishment is right next to the Ayung River and pretty far away from any main streets, so the only sounds you hear here are the rushing of the water, the wind in the trees and the singing of birds. The spa treatment started with me changing into a bath robe and meeting my masseuse on the deck. She prepared a foot bath filled with sea salt, spices, limes and flowers. After washing my feet she massaged them and we moved on inside for the actual Balinese body massage. Before the actual healing began, she asked me to hold my hands out and close my eyes. She then put her hands on top of mine and let our energies flow together. This was a process of joining our flows and connecting on a more spiritual level. She presented me with three different options for a body scrub: sacred spice (tumeric), cinnamon-coffee or authentic Balinese (nutmeg). I ended up picking the nutmeg one…something about that smell just makes me feel comfortable. These powerful local herbs are combined with powdered rice and then be applied to free your skin from dead cells and promote circulation after the massage is performed. The next hour and twenty minutes she massaged my whole body, starting from the feet and moving up. Half way through, she had me flip from my front to my back. 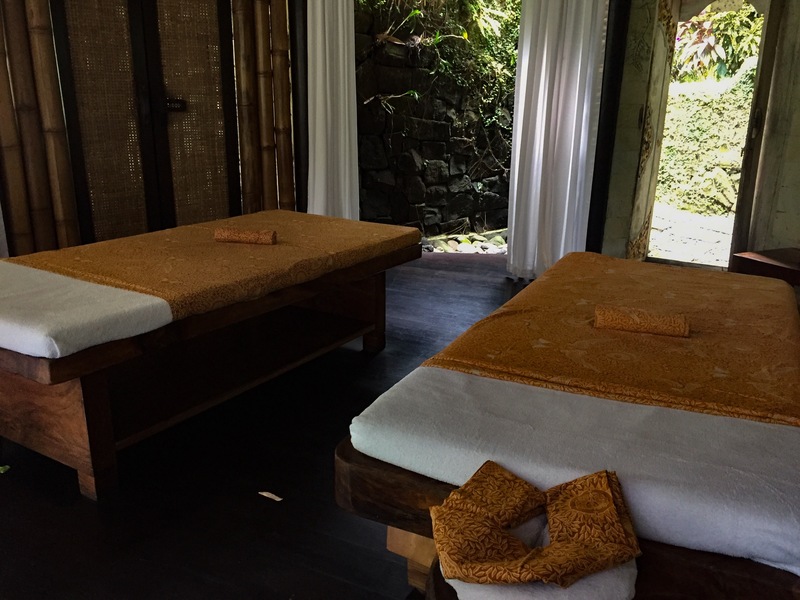 Balinese massages are very relaxing and focus mainly on skin rolling and firm/gentle stroking. Essential oils are also widely incorporated. For this particular massage she used coconut oil, which smelled heavenly. Balinese massages are strongly influenced by medicinal systems of India, China and Southeast Asia. I have to admit that as much as I enjoyed Thai massages, this was by far the best massage I have ever received. It was so much more personal, sensual and adjusted to what my body needed. After the massage, she combined my body scrub and applied it all over my skin. This was painful but so necessary. It awoke my skin and cleared away anything that was holding on. Let’s just say my skin has never felt so smooth and happy. After the scrub she prepared the bath for me, which was absolutely the part that I was the most excited about. The water was infused with Ahumsa bath oil and colorful Balinese flowers. I got to soak in this glory for a good 40 minutes and it was just as magical as I had imagined. The view was stunning (the trees and the Ayung river), the sounds were calming and the water felt euphoric on my skin. I finally felt like the princess that I was born to be…bathing in flowers just because I can. The whole spa experience lasted two full hours but I could have continued it all day long. I personally feel like this was on the same level as my trip to Singapore and you all know how I feel about that one. It was a dream, a magical dream. Yes Fivelements is pricey, I cannot and will not sit here and say that it is affordable for everyone because it is not, but because this is something that I really wanted to do, I saved up and invested in my health, which I do believe everyone should do (at least once in a while). My mind, my spirit, my soul and especially my body thanked me. I felt extremely relaxed, worry free and renewed. I really wish that everyone could experience that for themselves. I would 100% recommend Fivelements to anyone who is visiting Bali and specifically Ubud, since its the closest to that city. The location is superb, the staff is very knowledgeable and professional and the service is ever more extraordinary. Here are some more shots that I managed to snap.